“7 For one will scarcely die for a righteous person—though perhaps for a good person one would dare even to die— 8 but God shows his love for us in that while we were still sinners, Christ died for us.9 Since, therefore, we have now been justified by his blood, much more shall we be saved by him from the wrath of God. 10 For if while we were enemies we were reconciled to God by the death of his Son, much more, now that we are reconciled, shall we be saved by his life. 11 More than that, we also rejoice in God through our Lord Jesus Christ, through whom we have now received reconciliation“ (Romans 5:7-8, ESV). “But I am a worm and not a man, scorned by mankind and despised by the people” (Psalm 22:6, ESV). “44 It was now about the sixth hour [12 noon], and there was darkness over the whole land until the ninth hour [3 p.m.], 45 while the sun’s light failed. And the curtain of the temple was torn in two. 46 Then Jesus, calling out with a loud voice, said, ‘Father, into your hands I commit my spirit!’ And having said this he breathed his last. 47 Now when the centurion saw what had taken place, he praised God, saying, ‘Certainly this man was innocent!’ 48 And all the crowds that had assembled for this spectacle, when they saw what had taken place, returned home beating their breasts. 49 And all his acquaintances and the women who had followed him from Galilee stood at a distance watching these things” (Luke 23:44-49, ESV). “12 ‘This is my commandment, that you love one another as I have loved you. 13 Greater love has no one than this, that someone lay down his life for his friends. 14 You are my friends if you do what I command you.15 No longer do I call you servants, for the servant does not know what his master is doing; but I have called you friends, for all that I have heard from my Father I have made known to you. 16 You did not choose me, but I chose you and appointed you that you should go and bear fruit and that your fruit should abide, so that whatever you ask the Father in my name, he may give it to you. 17 These things I command you, so that you will love one another.’ 18 ‘If the world hates you, know that it has hated me before it hated you.19 If you were of the world, the world would love you as its own; but because you are not of the world, but I chose you out of the world, therefore the world hates you. 20 Remember the word that I said to you: ‘A servant is not greater than his master.’ If they persecuted me, they will also persecute you. If they kept my word, they will also keep yours.21 But all these things they will do to you on account of my name, because they do not know him who sent me. 22 If I had not come and spoken to them, they would not have been guilty of sin, but now they have no excuse for their sin. 23 Whoever hates me hates my Father also.24 If I had not done among them the works that no one else did, they would not be guilty of sin, but now they have seen and hated both me and my Father. 25 But the word that is written in their Law must be fulfilled: ‘They hated me without a cause.’” (John 15:12-25, ESV). “For as in Adam all die, so also in Christ shall all be made alive” (1 Corinthians 15:22). For man, undone by sin. The father of Isaac Watts was a respected Nonconformist, and at the birth of the child, and during his infancy, twice suffered imprisonment for his religious convictions. Isaac was the eldest of his nine children, who’s taste for verse showed itself in early childhood and he was taught Greek, Latin, and Hebrew by Mr. Pinhorn, rector of All Saints, and headmaster of the Grammar School, in Southampton. At the age of 16, he went to London to study in the Academy of the Rev. Thomas Rowe, an Independent minister. Leaving the Academy at the age of 20, he spent 2 years at home; and it was then that the bulk of the Hymns and Spiritual Songs (published 1707-9) were written, and sung from manuscripts in the Southampton Chapel. At the age of 24 years, he became assistant minister of an Independent Church in London, and 4 years later, he became pastor. In 1712, he accepted an invitation to visit Sir Thomas Abney, at his residence of Abney Park, and at Sir Thomas’ pressing request, made it his home for the remainder of his life. It was a residence most favourable for his health, and for the prosecution of his literary labours. He did not retire from ministerial duties, but preached as often as his delicate health would permit. The number of Watts’ publications is very large and embrace sermons, treatises, poems and hymns. His published hymns number more than 800. It is as a writer of psalms and hymns that he is everywhere known. Some of his hymns were written to be sung after his sermons, giving expression to the meaning of the text upon which he had preached. Composer – No information found. “(7) In the days of his flesh, Jesus offered up prayers and supplications, with loud cries and tears, to him who was able to save him from death, and he was heard because of his reverence. (8) Although he was a son, he learned obedience through what he suffered. (9) And being made perfect, he became the source of eternal salvation to all who obey him, 10 being designated by God a high priest after the order of Melchizedek” (Hebrews 5:7-9, ESV). Suffer for Christ, your election sure to make! For ’tis not too late with Christ to share. Present on the altar every labour of love. Layer upon layer of character, impearled. It will be mingled with Christ-like joys, we know. “Depend on God for mercy and grace,” we sing. Sharing God’s precious Truth with various kind. Only for self? Letting God’s Plan be unheard? From these tempters let our conduct be free. Even if those served count your words as but dross. Why should we flee, terrified of man, when reviled? Is not this a test for those reconciled? Helps us in such moments to be counted as victors! Without them, what testimony of sonship, and more? The answer may follow through unbidden tears. How God’s mercy does strengthen us through these carnal years. Are not tribulations what our Lord has forewarned? It would cost, the consecrated, all that we owned! Means sharing his sufferings, to the world unknown. But Christ’s name on our foreheads, will forever be worn! Shall reap fullness of joy when fulfilled is our vow. Then your clay jar of tears, will Christ to them remind. Rejoice in afflictions, walking in Christ’s light. Patiently accept them, kindly, like a good Samaritan. Man cannot stop us declaring, even through closed doors. Through tears may your trumpeting “ALL FOR JESUS” go on! Our Master in Gethsemane, offered loud cries and tears! Things misinterpreted by man — so please be at ease. So you, put your confidence, in the power of His rod. Of our privilege of service, which our heavenly joys increase. To become heavenly “stars” in Christ’s brightness. Changing from glory to glory since our sanctified anointment. Leads the heaven-bound follower, God’s will to fulfil. When in glory and immortal, we are united with Christ. Beyond the vail then gathered, all the Gospel’s true wheat. For God’s Spirit shall be poured upon all by His grace. No longer Adamic sin will cause all to die. Mankind will learn, and then show, their own faithfulness. Then tears no more shall ever again fall. God’s glory will then forever expand! Our Redeemer did not mean, Blessed are those that mourn because they cannot own a finer house. Blessed are those who mourn because they cannot buy an automobile. Blessed are those who mourn because they cannot buy the diamond they saw in the jeweler’s window. Blessed are they that mourn because their head aches so badly. No, no, He meant, blessed are those who mourned like He mourned. How different His mourning was from that of other people. There was something so unselfish about His mourning. You remember when He went to the tomb of Lazarus it was not for himself He was weeping. When He wept over Jerusalem He was not mourning for himself but for them. He wept as He thought how unwilling they were to praise and glorify God as they should, and what they were bringing on themselves because of their disobedience. Then there was another occasion when He mourned in the garden of Gethsemane. You remember His tears, His strong crying. There again there was something unselfish; it was not because He had to die that He wept; He came into the world for that very purpose. He wept because of that cup He was drinking then. What was that? The cup of expectation of death? No. 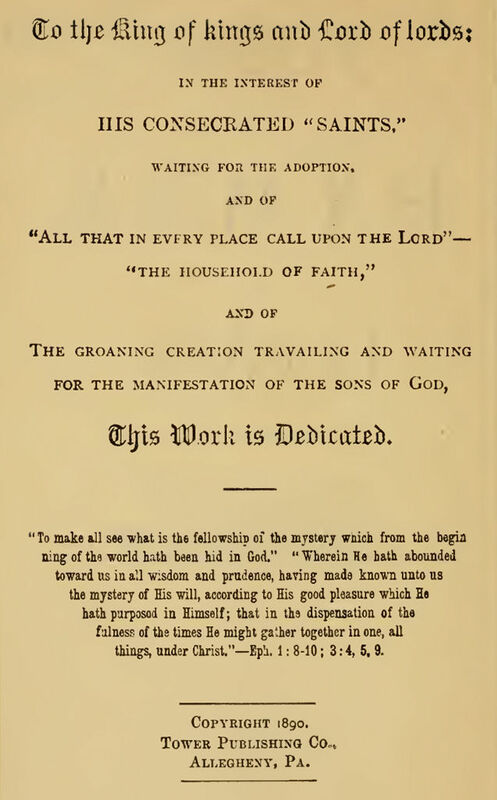 The Lord Jesus was so desirous that the Father should be pleased in every little point, and He realized that His ability to accomplish the work the Father entrusted to Him, the redemption of the race, depended upon His actual perfection; He realized there was no advocate to make up for His deficiencies; and it was along this line He mourned. There was nothing selfish about it. So we way, Blessed are we if we mourn like Jesus mourned, if our mourning is unselfish. Do you mourn because you want the Lord glorified to a larger degree than people seem to want you to glorify Him? Do you mourn because you want more of the joy and peace which comes from a closer acquaintance with God and a better understanding of His Plan? Oh, that is the right mourning! PE327 get over it. I cried and cried until I thought I would not have any sight left; and when it was all over I made up my mind I would never cry again. Another child died, but I did not weep. My wife died but I never cried. I had a great deal of trouble on various lines and I have always been able to restrain my feelings so it was not shown outwardly. But, he said, I go to bed at night and as I think of all my weaknesses and imperfections and my inability to serve God better that I do, I cry and cry until the pillow is wet with my tears. Oh, that was mourning like Jesus wanted us to mourn. That is the right kind of mourning. That is more in imitation of Jesus. If you mourn because you say so many things you don’t want to say, you mourn like Him. If you mourn because your hands do so many things you do not want them to do, you mourn like Jesus. If you mourn because your feet go so many places you don’t want them to go, you are mourning like Jesus. That is the way with Him. He mourned as His tongue and lips said so many things He did not want them to say. He mourned as His hands would engage in so many works He did not want them to do. He mourned as His feet would go so many places He did not want them to go. Yes, dear friends, Jesus was continually mourning because of those things. Why, you say, that astounds me! Do you mean to tell me that Jesus was imperfect? I thought He was perfect, I thought He was holy, harmless, undefiled, and separate from sinners. I thought He never did anything wrong, and now you say His lips said so many things they ought not to have said, and His hands did so many things they ought not to have done, and His feet went so many places they ought not to have gone. Is that really so? Yes, friends, it is so. But Jesus was perfect in spite of all this. He was holy, harmless, undefiled, separate from sinners. He never sinned. Then how do you account for that seemingly inconsistent statement you have made? PE328 and Judas’, and then Andrew’s tongue—Oh, how much trouble He had with His twelve tongues! It is bad enough for us to have the one. We know how much trouble it gives us. I have sometimes thought of a verse that says, “O, for a thousand tongues, to sing my great Redeemer’s praise. !” I am so thankful in God’s providence He has not inflicted a thousand tongues on me; yet if they would all sing my great Redeemer’s praise it would be all right. I would not mind it; but I am afraid that while about three of them would be singing the praise, the other nine hundred and ninety-seven would be in some kind of mischief. But we see Jesus had twelve tongues to give Him trouble, and those twelve pairs of hands that would not always do His will, and those twelve pairs of feet that wandered so frequently. Think what that must have meant to Him. You see in a certain sense He had a similar experience to ours, only with Him it was with members of His mystical body. O, how the Apostle bore the burden of the Church’s peace and tranquillity upon his heart as he languished in dungeon dampness, or spent the days in weary toil, making tents that he might continue spending and being spent in the service of the Church he loved so intensely, until he had been literally poured out as an offering on the sacrificial altar of devotion to them! And how sympathetically we may enter into his disappointments and anxieties as again and again he is reminded of the immaturity, carnality and contentiousness of so many for whom he would willingly die, as we see those burning tears of affection blinding his afflicted eyes as he laboriously pens his fervent entreaties to these bickering, factional brethren! Our tears must flow in unison with his and for the same reason that today as in his day the unity of the faith is so often marred or disrupted by the same things. But there were bright and happy experiences mingled with St. Paul’s frequent disappointments, oases in the way, where the seeds of truth had fallen and germinated, producing the luxuriant greenness that shone out in pleasing contrast to all the barrenness around, where the Gospel of Christ had been permitted to exercise its grace and power and make manifest its sanctifying, ennobling, maturing effects. If in writing to the Corinthians he must reprove and lament and deplore much of what he found there, not so in writing to the Thessalonian brethren. To these dear brethren he could write with the strains of our text as a sweet melody in his heart, “I am not ashamed of the Gospel of Christ; for it is the power of God unto salvation to every one that believeth.” He could point to these faithful brethren who had always been loyal, responsive, and reciprocative as a living testimony of the Gospel’s fruitage. We may again share with him his joy as he remembers the operations of grace in his own life, of all that “seeing Jesus” had meant to him personally, and of his energetic enthusiasm to make Him known to others; and we can enter into his joy as he writes these precious sentiments of commendation and love, “And you followed the pattern set you by us and by the Master, after you had received the message amid severe persecution, and yet with the joy which the Holy Spirit gives, so that you became a pattern to all the believers throughout Macedonia and Greece. For it was not only from you that the Master’s message sounded forth through Macedonia and Greece; but everywhere your faith in God has become known so that it is unnecessary for us to say anything about it” (1 Thessalonians 1:6-8, Weymouth). “Remembering without ceasing your work of faith, and labor of love, and patience of hope in our Lord Jesus Christ, in the sight of God and our Father” (Verse 3). “For what is our hope, or joy, or crown of rejoicing? Are not even ye in the presence of our Lord Jesus Christ at His coming? For ye are our glory and joy” (1 Thessalonians 2:19, 20). “We are bound to thank God always for you, brethren, as it is meet, because that your faith groweth exceedingly, and the love of every one of you all toward each other aboundeth; so that we ourselves glory in you in the churches of God, for your patience and faith in all your persecutions and tribulations that ye endure” (2 Thessalonians 1:3, 4). (Reprints of the Original Watchtower and Herald of Christ’s Presence, R4513). Love that is perfect, love that never fails. Soothes all the trials and the cares of life. And lights my pathway with its golden rays. And free them from the bonds of sin and strife. In Time shall feel His power and know its grace. Reveal His love, mankind shall serve Him then. Eternity its limit of duration. So broad, this love, it takes the whole world in. But reaches all with its unfailing grace. It fills the universe, it lights the stars. No selfishness its perfect beauty mars. It knows no limits, varies not, nor ceases. Knowing Thou watchest o’er me from above. That shield from all that threatens or alarms. And self shall be absorbed in love’s pure ray. And every earth stain from my heart efface. And daily like the perfect pattern grow. Life lived in love, eternity begun. “Do not be anxious about anything, but in everything by prayer and supplication with thanksgiving let your requests be made known to God” (Philippians 4:6, ESV). “One thing have I asked of the LORD, that will I seek after: that I may dwell in the house of the LORD all the days of my life, to gaze upon the beauty of the Lord and to inquire in his temple” (Psalm 27:4 ). O, His love, it lasteth ever! If thou wilt be his own! And human love above, though nobly striven. God’s love is greater far than thine or mine. A love beyond all loves, save God’s above. 7Beloved, let us love one another, for love is from GOD, and whoever loves has been born of GOD and knows GOD. 8Anyone who does not love does not know GOD, because GOD is love. 9In this the love of GOD was made manifest among us, that GOD sent his only Son into the world, so that we might live through him. 10 In this is love, not that we have loved GOD but that he loved us and sent his Son to be the propitiation for our sins. 11Beloved, if GOD so loved us, we also ought to love one another. 12No one has ever seen GOD; if we love one another, God abides in us and his love is perfected in us. 13By this we know that we abide in him and he in us, because he has given us of his Spirit. 14And we have seen and testify that the Father has sent his Son to be the Savior of the world. 15Whoever confesses that Jesus is the Son of GOD, GOD abides in him, and he in GOD. 16So we have come to know and to believe the love that GOD has for us. GOD is love, and whoever abides in love abides in GOD, and GOD abides in him. 17By this is love perfected with us, so that we may have confidence for the day of judgment, because as he is so also are we in this world. 18There is no fear in love, but perfect love casts out fear. For fear has to do with punishment, and whoever fears has not been perfected in love. 19We love because he first loved us. 20If anyone says, “I love GOD,” and hates his brother, he is a liar; for he who does not love his brother whom he has seen cannot love GOD whom he has not seen. 21And this commandment we have from him: whoever loves GOD must also love his brother. “Poems of the Way” – Compiled by Martin C. Mitchell. Our Heavenly Father is the God of all comfort and whatever difficulties His children encounter, because we are under His peculiar care, His compassion and watch care are ever present and he is most worthy of our praise. What are some of the means God uses to comfort us? Here are several, including: conventions, the ecclesia arrangement, prayer communication, God’s overruling providence, Hymns and Psalms, Scriptures that provide doctrinal instructions, scriptures that contain precious promises for our meditation, guardian angels that intervene on our behalf when necessary and of course the Holy Spirit which enables us to appreciate and comprehend the Father’s tender mercies. Ultimately, praise also will be an integral part of the human family’s make up, when they realize in the Kingdom the scope of what the Heavenly Father has done for them through the magnificent sacrifice of Jesus as well as the part we the body of Christ will have to play in helping to restore mankind back into heart harmony with God during that glorious Millennial reign. We would like to suggest the 24th Chapter of Isaiah speaks of the judgments that will end this present evil order and then comment on what follows in Isaiah 25:1-9 which we feel pictures the expressions of humanity as a result of that glorious Kingdom in operation and mankind progresses up the Highway of holiness. So we will read each of these verses followed by a brief comment as to how we view these matters. Here we would suggest Israel would desire to praise Jehovah especially for bringing them through Jacob’s trouble and ending the oppression they have endured at the hand of others. Similarly, others who fear God and recognize the restraint of evil and the opportunity for blessings will echo heartfelt worship to the Almighty and his Christ as they recognize the reign of righteousness that has commenced. The may well refer to the destruction of Mystic Babylon. Those who were once blinded under the influence of the adversary and the dogmas that vilified God’s character will worship the God of love and demonstrate a similar attitude towards their fellow creatures. The iron rule that will be in force. Every knee must bow and every tongue must confess and accept the gracious provision on their behalf made possible through the redemptive merit of Christ in order to gain everlasting life. This might refer to the downtrodden in this present life who were insignificant nobodies, but when Christ reigns in equity and justice, when the Spirit and the Bride say “come” all who have been athirst will be able to partake of the water of life freely. Throughout the reign of sin and death the human family has been starving for blessings and a ray of hope that things might be better for them. What joy they will have as they see the work of restitution in progress. The wine of pure doctrine will bless them abundantly. This seems to speak about the eradication of the death sentence and the removal of the blindness that has covered the eyes of the human family, thus preventing them from seeing the glory and goodness of the Father. When the kingdom is established the human family will begin to comprehend his attributes and as they prosper under that arrangement how much they too will increase in their ability and desire to praise our Creator. We have attempted to describe why the church now and the world during the Kingdom reign will have much reason to praise our Heavenly Father. This great hymn was written by Fanny Crosby (1820–1915). When Fanny was 6 weeks old, she caught a slight cold & had inflamed eyes. The family physician was away. Another country doctor was called in to treat her. He prescribed hot mustard poultices to be applied to her eyes, which destroyed her sight completely! It was later learned that the man was not even qualified to practice medicine. Fanny never felt any resentment against him, but believed it was permitted by the Lord to fulfill His plan for her life. It seemed in­tend­ed by the bless­ed prov­i­dence of God that I should be blind all my life, and I thank him for the dis­pen­sa­tion. If per­fect earth­ly sight were of­fered me to­mor­row I would not ac­cept it. I might not have sung hymns to the praise of God if I had been dis­tract­ed by the beau­ti­ful and in­ter­est­ing things about me. Fanny’s spiritual development came from her grandmother who cared for her while her mother worked as a maid. A landlady, Mrs. Hawley, helped Fanny memorize the Bible. Often she learned 5 chapters a week! She entered the New York City Institution for the Blind around 1835, completed training, and taught there from 1847 to 1858. In 1858 she married a musician, Alexander Van Alstyne, who was also blind. Fanny needed five dollars one day and she just knelt down and told the Lord about it. Soon after a stranger knocked at her door as he just wanted to meet her. As he left, he pressed a five dollar bill into her hand. “I have no way of accounting for this” she said, “except to believe that GOD put it into the heart of this good man to bring the money”. “My first thought was that it is so wonderful the way the Lord leads me, and I immediately wrote the poem”. In 1874, Fanny Crosby wrote the hymn “All The Way My Savior Leads Me”. I do not know whether Fanny Crosby was a spirit begotten child of God, but as I reflect upon her life, I can only hope that each of us will be more appreciative of the blessings we have today in Christ and will desire to live a life of praise daily for all our Heavenly Father has done for us. AMEN.